How to convert long to String in Java? Here is our sample Java program for this data type conversion. In this program you will learn all these three methods of converting primitive long to String in Java. System.out.println("String value created from long by concatenation : "
1) String.valueOf(long) method internally calls Long.toString() method. 2) If you pass sign along with number e.g. positive or negative sign then converted String will also contain that sign but only for negative numbers, not for positives. 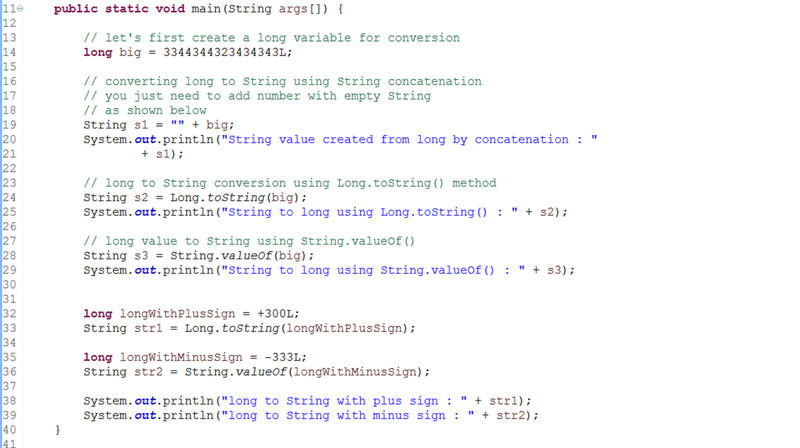 That's all about how to convert long values to String in Java. It's better to use Long.toString() method because all other method internally calls this one only. 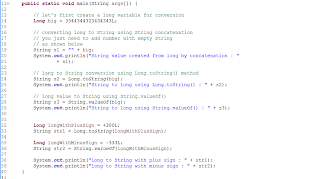 If you know how to convert int to String or double to String, you can follow same steps to convert other data types to String in Java as well.